Nineteen bodies have been found in Staten Island following Hurricane Sandy and many fear the number will rise. A growing number of Staten Islanders are outraged by what they describe as the slow response from relief organizations. NBC News' Ann Curry reports. Staten Island, just a ferry ride from Manhattan but often seen as the neglected stepchild of the New York metropolis, apparently was the city's deadliest zone in Superstorm Sandy – accounting for half the human toll. On Thursday the bodies of two young boys who were swept away from their mother’s grasp during the storm surge were recovered, NBC News reported. A missing husband and wife were also found dead Thursday, NBCNewYork.com reported. That brought the toll on the island to 19, NBCNewYork.com reported. On Thursday, Mayor Michael Bloomberg said Superstorm Sandy is responsible for the deaths of at least 37 New Yorkers. Glenda Moore, and her husband, Damian Moore, react as they approach the scene where at least one of their childrens' bodies were discovered in Staten Island, New York, on Thursday, Nov. 1, 2012. Brandon Moore, 2, and Connor Moore, 4, were swiped into swirling waters as their mother tried to escape her SUV on Monday. At a news briefing Thursday morning, elected officials pleaded for help for Staten Island. Borough President James Molinaro blasted the Red Cross as an “absolute disgrace” and urged the public to stop giving to the venerable institution. At a press conference, Staten Island Borough President James Molinaro says "It's an absolute disgrace" that the American Red Cross is "nowhere to be found" during his county's time of intense need in the wake of Hurricane Sandy, especially after collecting "lots and lots of money" from people in his district used for relief efforts elsewhere. 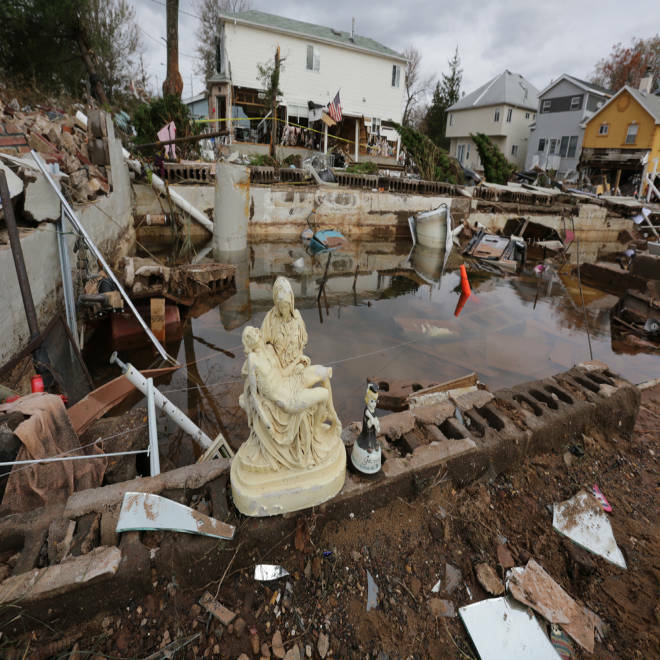 Indeed, Staten Island, which took a direct blow from Sandy, is a scene of immeasurable misery and utter devastation, with homes obliterated, others off their foundations in addition to widespread flooding. "The city of New York right now is talking about getting water out of the Battery Tunnel and preparing for a marathon," U.S. Rep. Rep. Michael Grimm said. "We're pulling bodies out of the water. You see the disconnect here?" NYPD officials have denied to NBC News that Staten Island’s working class neighborhoods have come after wealthier areas. “We are heading into the area where there is major destruction now,” Red Cross spokeswoman Anne Marie Borrego told NBC News late Thursday. Little remains of a home on Yetman Avenue in Staten Island where homeowner George Dresch and daughter Angela, 13, perished in Hurricane Sandy. Patricia Dresch is reported to be in critical condition. The Red Cross, Borrego said, has five emergency response stations set up at New Dorp Lane in the borough and the organization’s New York CEO, Josh Lockwood, is on the scene. While looking over the wreckage of his cousin's house on Thursday, Tom Monigan talked about his cousin George Dresch, who died in the surge of water with his daughter Angela, 13, on Staten Island. George Dresch's wife Patricia was reported to be in critical condition at the hospital. "Not in a million years, did I expect to see this," Monigan told NBC News. "This is unbelievable, I mean for George to lose his life and his daughter and his wife to be in the condition she's in it's a sin, it's unreal, I can't believe I'm looking at this. Terrible." "You can replace this stuff, but it's what happens to people," Monigan said, "it changes their life forever and it's terrible. People are worried because they don't have electricity, Jesus, this is the real deal right here." Rescue workers who are part of a task force of searchers gathered on Staten Island on Thursday have fanned out with maps to search the hardest hit areas in the city. Large trucks and other equipment with Homeland Security decals began arriving late in the day on Sunday. The boys whose bodies were found Thursday were identified by the New York Police Department as Brandon Moore, 2, and Connor Moore, 4, NBCNewYork.com reported. A police description of the incident said that after their home became flooded and lost power, their mother, Glenda Moore, was attempting to drive them to relatives' home in Brooklyn when her Ford Explorer stalled in rising water on Father Capodanno Boulevard. Glenda Moore managed to free the boys from their car seats and tried to hold onto them, but the force of the water ripped them from her grasp. According to the Moore's sister, Moore had pounded on doors for help during the height of the storm, but no one was willing to help her. About two dozen NYPD officers had been searching for the boys. Their bodies were discovered in a marsh early Thursday, NBCNewYork.com reported, about 15 yards from each other up against debris and a tree near where the SUV was overturned from the storm surge. Some 470,000 people live in the Staten Island borough of New York, according to census figures, and many areas of the borough, were spared. The Staten Island museum and zoo were both operating on Thursday, and ferry services was expected to resume in a day or two, according to the island's tourism website. NBC News producer Craig Melvin, WNBC investigative producer Shimon Prokupecz, WNBC investigative correspondent Jonathan Dienst and NBCNews.com multimedia producer John Makely contributed to this report. An incredible time-lapse video from the 51st floor of the New York Times building in midtown shows the progression of the storm as Sandy slammed New York City.